Pre the recent election their attitude was of little importance, the focus, indeed the purpose of the election was to increase the majority of the ruling party. This weekend Labour have signaled a major shift in their policy, unusually Labour would not be associated with Business interest, however their new policy statement is very much in line with Business aspirations. Incoming week EU27 will offer a guarded welcome. 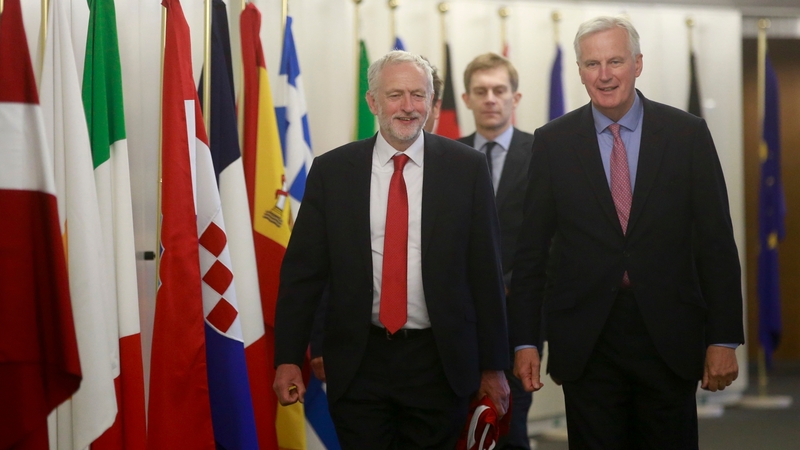 Britain's Labour Party has shifted its policy on Brexit, saying it supports staying in the EU's Single Market and Customs Union for a transitional period of up to four years before the UK formally leaves the EU. More talks concluded - looks like the divorce bill is causing some problems, this can be a difficult one due to the surrounding publicity thus far. Progress on the Ireland aspect, but no details as yet. Not bad so far, actually much better than many have been expecting - long way to go. Just an update - divorce bill still a problem, the 20b offered fits snug with a 2 year transition so is sellable in the UK but not acceptable to the 27. The changed political set up in UK is recognized in Europe, the difficulties that the PM faces, in particular with some members of cabinet who may well make a play for leadership, in this light the 27 have agreed to talk among themselves on a trade deal. Good news is that UK media are reporting that this supposed huddle talk is a result of threats yet again of accepting a ‘no deal’ and resorting to WTO trading - job done. This week I spoke to a UK citizen living in France this past 20 years. Recently tried to renew her mobile phone contract, never a problem before but this time when the UK passport was produced it was “ce n’est pas possible”. It is always the little people in the middle who suffer, the power players sleep well. There are aspects of Brexit that go unreported in the UK press, and in the 27. In my own area Bombardier are under pressure from US, the EU would normally have had an input, but sadly they decided that the UK would have to fight this on their own. In UK it is a small story - Bombardier vs Boeing - UK PM made a call to US President, but business is business, it’s a mere 4000 jobs. For UK there is talk about Brexit with no deal and their planning for same, likewise in EU27. So a hardening of attitudes. I just wish that the hard guys would step back, there is no such thing as a winner or loser - just business and people’s jobs, their livelihood, what they bring home. In manufacturing there is a concept, it’s called JIT. We use it every day, a hard Brexit will take that away. When we ‘export’ to the EU there is presently zero barrier, no VAT, no special records, just do the business and tell Intrastat at the end of the month, likewise when we ‘import’. It’s not even recorded as export, it’s merely a ‘dispatch’ - effortless, seamless, minimal red tape - ideal for ‘Just In Time’. 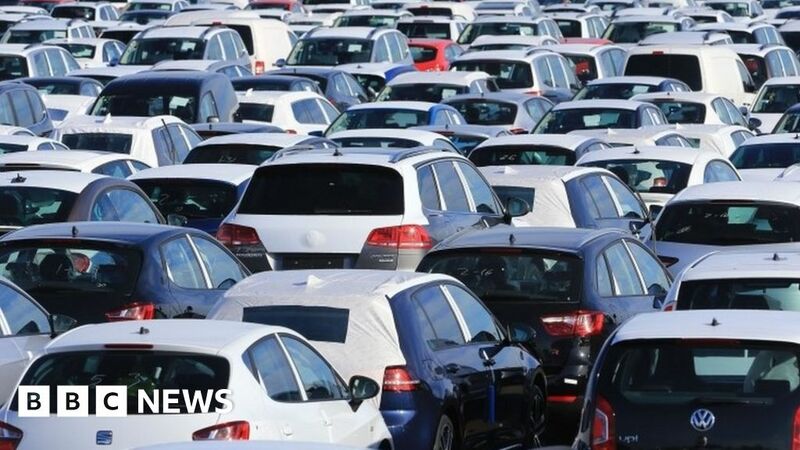 Until recently, new car sales in Britain were booming. Now, things look very different. The just-in-time inventory system is a management strategy that aligns raw-material orders from suppliers directly with production schedules. @peterma - As one of those who voted to join the “Common Market” all those years ago, I was annoyed afterwards that we were made to disband the “Commonwealth” - something which never apeared on the “Information” about “Going in” - That is what we joined - we did not join any form of political union. That is why we voted to leave. Yeah I remember the vote you are referring to, but the UK was already a member by then, the public didn’t get to vote on entry to the EC, the 1975 vote was to ‘guage’ continued support and was non-binding. The thrust of this thread is the EU27 going forward, I was saddened to see the lack of support for Bombardier from that quarter and have highlighted same. The effect on manufacturing both in UK and EU27 will be most felt in the early days, one aspect is JIT. TBH most business has zero interest in the reasons and politics etc - more how to protect and profit post Brexit. One way of doing that is to be aware of the likely difficulties and just like trading then create and implement a plan. I’m really interested in increase of fiscal spending in UK since their independence will probably require more support to bring key economy sectors dependent on EU back to balance. After the Brexit vote the sitting FM - G Osborne - was replaced with the current Hammond. Many guys took the view that T May decided on the basis of personality, not true, Hammond is more like an entrepreneur, the need to spend in order to reap, Osborne was focused on austerity and getting the borrowing down. Hammond’s approach is proving and will prove to be the correct one, not reckless borrowing but likewise there are times that risk must be embraced - with caution. Note that the prelim gdp was higher than exp on Wed past, the higher the more room for borrowing. From EU27 perspective a similar outlook, a corner has been turned in EU28 - this is why it is important that politics plays a back seat, the notion of nationalism or posturing will not put money in peoples homes. Cool heads and common sense will be win win, the focus must stay with keeping GDP rising. 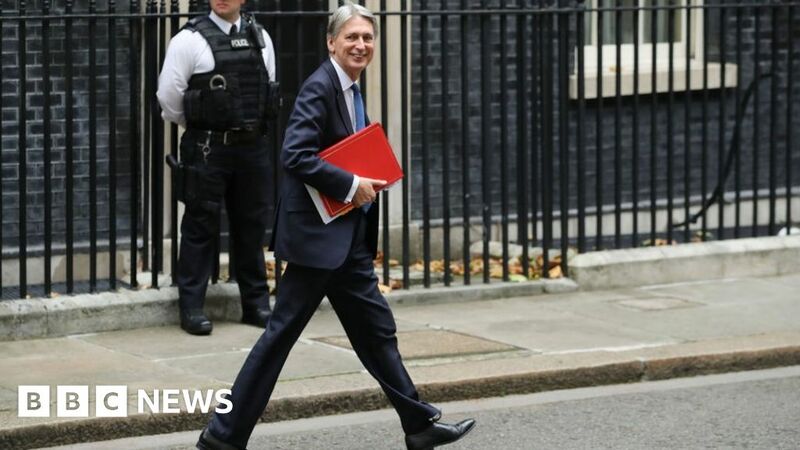 Philip Hammond is in a more positive mood after better-than-expected economic data. He tells the BBC now is not the time to borrow more. I feel there are some tax cuts coming as monetary policy failed to spur economic growth. Still the propensity to consumption is higher, rising wages-inflation gap is temporary and the key goal is to rescue motivation of nation to spend and monetary policy is the least powerful measure. For the UK the risk lies in consumer spending, you are correct. This rise will not help, in fact it will add to the risk, consumer spending is dictated by many things, often consumer confidence is the most important. If my wife becomes fearful of the future and I say we need a new car - we don’t get the car, it’s that simple. In my own business we are seeing a raft of price increases on the wholesale side, all timed for spring of 2018 - tinkering with the interest rate will not stop those. The one tax rate that would change risk dramatically is so simple yet it would take an act of bravery from the politicians, for this reason I doubt that it will happen, merely can hope. For US readers VAT is a sales tax. Time for a break, had hoped to sign off on good news 5 days from now, but not to be. The ‘discussions’ are in a bad place and going nowhere. The US have signaled (Wilbur Ross, US commerce secretary) that the UK have to diverge from EU food standards if they wish to do a trade deal - speech to CBI this week. Secretary Ross questioned the science behind the current EU regulations, an argument not unlike the Environmental discussions of late. Are we (Uk) a net exporter of food ? Seriously, no US trade deal that I know of doesn’t include agriculture - it’s a vote winner. Hmmm… buy Gbp between now and then Je Crois. nigel farage/johnson-populists: if you vote yes we will build our beloved great long lost empire back up and see the greenest meadows everywhere! people followed the populistic lies (HNS-lie, immigration-lie, no deal-lie, growth-lie) and are beeing presented the bill for the informed but still bad/wrong/poor decition. all the information was out there and people did decide, its only fair that the people now pay the bill. every job lost in the UK is a new job created in spain portugal france or wherever in the EU, so please pardon that i have absolutely no simpathy for the small xenophobe men in UK who voted to leave and is now surprised that the leaders and intelligent people of his own county knew more about it and were right in the end. this is only the beginning. the boom growth of the last 40 years in the UK were anyways only due to the fact that the UK was a member of the EU. when UK joined the EU it was called “the sick men of europe”. now this positive effects and growth the UK recieved from to the EU membership will be given back step by step. we both remember very well that the “power players” are/were all against brexit. Not so. They were divided, just like everyone else. Many cabinet members campaigned actively for “leave”. Some people in power said that. Wrongly and stupidly. Especially George Osborne, former Chancellor, sacked by the incoming Prime Minster for getting everything wrong. He predicted an immediate recession after a brexit vote, and this was rubbish. Meanwhile unemployment throughout Southern Europe is rampant, while the UK has both the lowest unemployment for decades and the highest number of people in work ever! You must have got your “facts” from some other planet, I think - obviously not from this one. when UK joined the EU it was called “the sick men of europe”. This is pure fiction, just like all the rest of your post. stay fair pete. poppulism like this sentence are below your level. did i hurt your emotions much? As usual, the only person getting emotional when having their posts corrected is you. Perhaps if you untangled your facts from your fiction these fella’s wouldn’t have to correct you so often. As always, your attention to detail leaves much to be desired, as does you & your fellow forum jaw flappers inability to read the psychological mood & bias of mass participation. And that my little darling’s is where the proper money is made in this industry, which explains why armchair analysts & jaw flappers fall well short of the mark time & time again. You even embarrassed yourself with that ridiculous trading challenge charade a few months back, demonstrating you’re no more clued up than the average forum newbie. Probably a good thing you fella’s rely on traditional business income to pay your way through life as opposed to relying on trading profits. Honestly, you analyst types couldn’t pick the winner in a one horse race. You do however have a penchant for talking the hind legs off a donkey, I’ll give you that. Interesting little article written by a “remainer” it would seem. The article does touch briefly on what the main problem with Britain was back then, well the real problem, except raging inflation and Yuuuuge Balance of Trade deficits. The Unions continued becoming stronger and stronger, to the stage that we could no longer afford to pay their huge pay demands. We had continual strikes and power cuts - even an official 3 day week because of Union action. MAggie went head to head with the unions, after sneakily preparing the ground and brought the deficit under control late 70’s early 80’s - That was nothing to do with the “Common Market” and is virtually ignored by that biased article, as was the fact that she also single handedly destroyed all heavy industry in the UK ! That chart interestingly choice of comparitors btw - shows that for the last 10 years or so since the “EU” has been expanding thier “Power base” and becoming more and more controlling, the line stays stubbornly flat.